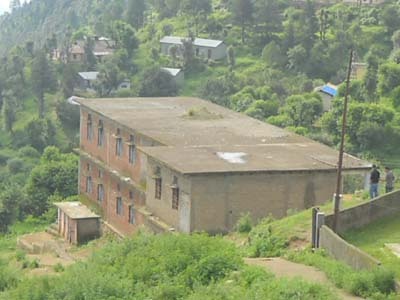 Gangolihat is a small Himalay view hill town in the Pithoragarh district of Uttranchal in India. This town is very famous for Maha Kali Temple of godess Kalika. The closest tourism destination to Gangolihat is Patal Bhuvneswr cave at 13-18 kms. Also nearby are the tiny hill stations of Chaukori and Berinag at 20-35 kms far. These places are famous for theri himaly view and Maldar’s ‘Chaay Baagan’. From Gangolihat everyone can see Panchchuli peaks and Nanda Devi clearly. Gangolihaat also known as ‘Gangawali’ is popular for its many more ancient temples and caves. Maha Kali Gangolihat (haat kalika), Chamunda Devi Mandir, Lamkeswr Mandir and Vaishnavi temple are some of the famous temples in Gangolihat. Like these ancient temples here are many beautiful and attractive caves. Patal Bhuvneshwar, Mukteshwar, Kotheswar, Gupte swar and Shailashwar Gufa are most famous caves. Recently A new cave has been also found village near Bhooligaon which is named 'Bholeshwar Gufa'. The famous Haat Kalika Mata Mandir was chosen by Aadi guru Sankaracharya for establish of Mahakali Shaktipeeth. Haat Kalika is very famous in all over the Country. This is also known as for power of Indian Army. Capt. Bikram Batra (Posthumous Param Veer Chakra award winner) was a great devotee of Kalika Mata and had created an Army Rest House near the Temple for Army Personnel, who come here to get the blessing of Kalika Mata, when they are at borders in frounts of the enemy. The famous Kumaoni poet Gumani belongs to Uprara village, which is at a little distance from the Gangolihat. Gangolihat is situated at the point of Almora-Pithoragarh old foot paath which meets with the New motor road of Ghaat to Bageswar. Gangolihat area lies between the famous Rivers Saryu and Ramganga, for wich this area referred to as Gangawali today. By the Train, the nearest major railway station to Gangolihat is Kathgodam (KGM) also known as ‘Kumoun Dwar’ which is at a distance of 200 kilometres. The nearest airport is at Pant Nagar which is at a distance of about 250 kms. Hear also available Tourist Rest Houses and few ordinary private hotels lik Hotel Sah, Hotel Girja etc. This is nice information about gangolihat..